Whether you're creating a piece of furniture or building or renovating your home, we can help along the way. Our line of custom components will add value as well as a personal touch to that special project. 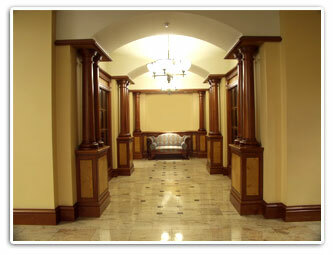 Custom Dressing - Whatever your dressing requirements are, Halifax Specialty Hardwoods can service your needs. Dressing services include face jointing, edge finishing and thickness planing to your specifications. We can finish components to meet your specific cutting list. Custom Moulding - We can replicate profiles for any custom mouldings you require or modify existing mouldings to better fit your application. We also specialize in custom components such as nosing, stair treads and thresholds – made to fit your individual application. Custom Laminating - We can laminate up panels or solid tops (face-grain or edge grain) to your specifications. Custom Flooring - We manufacture wide plank flooring in a variety of species to meet your particular needs. If you are looking for a high quality unique flooring, we can help you out. Custom Products - Our stock is not limited to that listed on our site. Feel free to call with your requirement and we will do our best to assist you..